Outrigger canoes in the Selat Lombok, between Lombok and Bali. 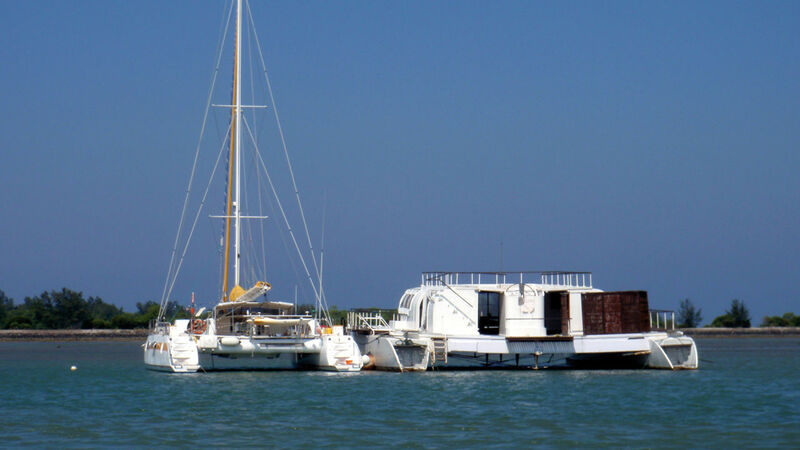 An example of the local multihull production… Rather aesthetic, no? 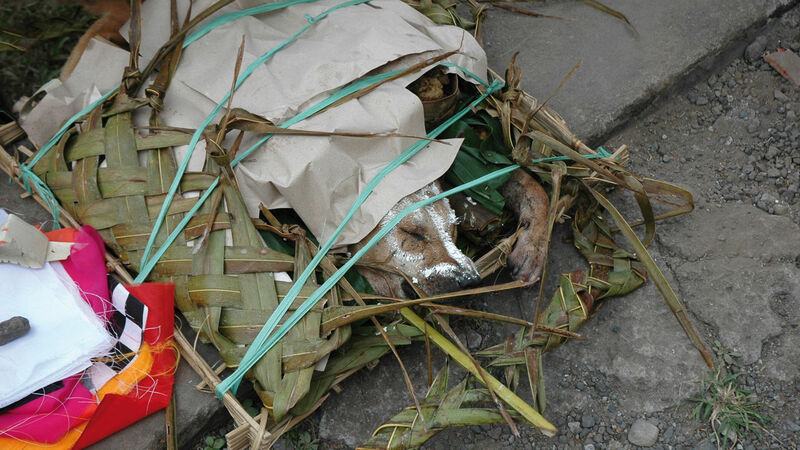 We were always welcomed warmly in Bali’s Hindu temples. In the paddy fields close to Abadi, Bali. One of my favorite photos from our voyage. All of humanity is in this old lady’s face. The best known surfing locations in the south west of Bali. Here one can meet a rather particular local fauna, and in the main it was one which didn’t particularly appeal to me. 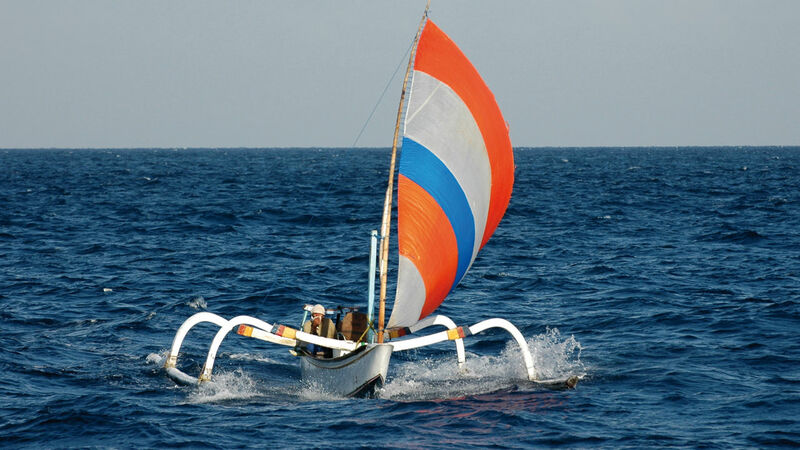 In the Selat Badung, Jangada speeds along at 12 to 13 knots, carried along by a strong south-west going current. The swell in this strait is impressive, with 5 to 6 meter waves, despite the wind not getting above 15 knots. The entrance to the port of Benoa isn’t easy to find, especially as we were crabbing across, with more than 40° of leeway… I’d never seen anything like it. We had arrived in Bali! As there was no space in the tiny marina, we moored up alongside this failed boat, which served as a large platform for Marin and Adélie to transform into their personal games room while we were there. Xavier introduced us to Moody, a resourceful Balinese chap, who rented us a car for the duration of our stay at a very competitive price. He also did lots of things for us while we were there. As we couldn’t get into the marina, he brought over jerrycans of diesel. In total he brought over 1000 liters to fill our two tanks, and paid the derisory price of 5,500 rupiahs per liter, or 45 euro cents! What’s nice in Bali, is their notion of service and availability of the Balinese. It’s not just that everything’s possible, it’s also the fact that they are usually very efficient too. And always with a smile! Bali is a small island with a little more than 3 million inhabitants. It’s the only Hindu territory in the immense Indonesian archipelago, which is mainly Muslim. However, the Balinese idea of Hinduism is rather different to that in India. It’s a kind of amalgam of certain Hindu beliefs, Buddhism, old Malaysian cults, and blended with some animist beliefs. 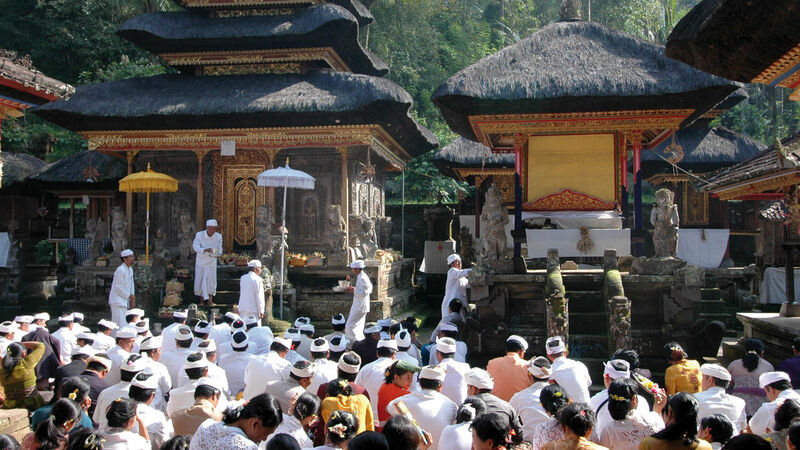 This amalgamation of religions is strongly entrenched in the Balinese daily life. It’s what helps to create the charm and the interest of this very touristy island which has managed, despite the many visitors who are concentrated in certain areas, to create and preserve traditions and a culture which is unique in the world. I was particularly impressed by the calm and tolerant nature of the locals. Religion is well integrated into Balinese daily life, and it just seems to be totally natural to them. Religious rites and prayers are a daily duty, and in them one can see both the religious fervor as well as their skill in making offerings, upon which some Balinese spend up to 40% of their income. Some of the rites are definitely animist. By chance some of the visits we made during our stay, we saw some of these different, colorful ceremonies.